START at the bus stop/shelter facing EASTWARDS on the B1261 near the junction with Irton Moor Lane, Irton. Proceed to Seamer roundabout where ENCIRCLE and retrace on the B1261 heading westwards to Ayton to join A170 at mini TI at East Ayton. Continue on A170 through West Ayton, Brompton and Snainton. Just after Snainton village bear left onto B1258 and continue west for approx 1 mile to sharp left-hand bend. Take a right turn here (with care) and immediate left along the lane to Allerston. At the T junction at Allerston take a left on unclassified road to junction with unclassified road and B1258 at Yedingham where left and left again on B1258. Continue northwards back to the Ebberston corner where left to REPEAT the triangle back to Yedingham via Allerston. Left on B1258 again to continue northwards to Snainton and the main junction with the A170. Turn right to rejoin A170 (WITH CARE). Continue eastwards on A170 retracing through Snainton/Brompton/West & East Ayton, taking second exit (effectively right) at mini TI at East Ayton on B1261 to FINISH just short of Seamer TI at stone village sign “Seamer”. **Basically this is again updating the second version of the 25m course, where the start was in Seamer village towards Seamer roundabout. The reason is to avoid village traffic congestion and the pelican crossing! Please note you are doubling back not far from the start after encircling Seamer roundabout before heading west to continue the normal route. It finishes in the same place as before at Seamer roundabout. Where it states "Ayton Road" on the map below, that's the new start. START in Seamer village on B1261 at Stockshill at 30mph sign (opposite Londesborough Arms) and proceed over humped crossing to Seamer roundabout and Irton B1261. Left to Ayton to join A170 at mini TI at East Ayton. Continue on A170 through West Ayton, Brompton and Snainton (approx 11.7mls). Just after Snainton village bear left onto B1258 and continue west for approx 1 mile to sharp left-hand bend. Take a right turn here (with care) and immediate left along the lane to Allerston. At the T junction at Allerston take a left on unclassified road to junction with unclassified road and B1258 at Yedingham where left and left again on B1258. Continue northwards back to the Ebberston corner where left to repeat the triangle back to Yedingham via Allerston. Left on B1258 again to continue northwards to Snainton and the main junction with the A170. Turn right to rejoin A170 (WITH CARE). Continue eastwards on A170 retracing through Snainton/Brompton/West & East Ayton, taking second exit (effectively right) at mini TI at East Ayton on B1261 to FINISH just short of Seamer TI at stone village sign “Seamer”. 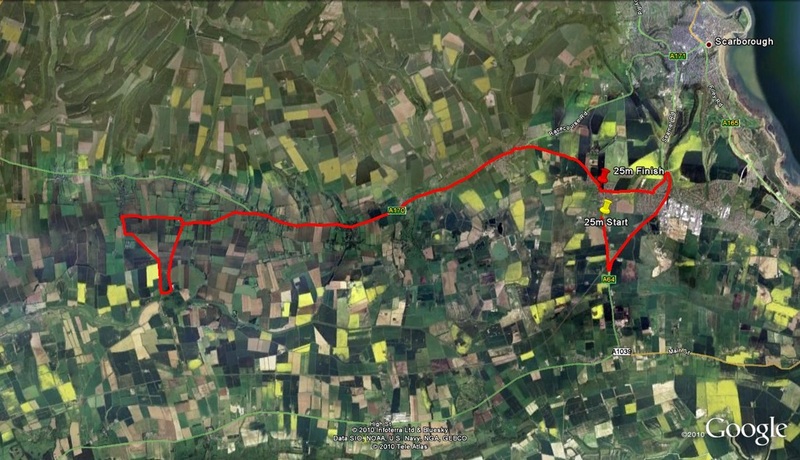 **Basically this is removing the original course version’s first section of A64 Musham/Crossgates triangle to Seamer (5m) and adding another lap of the Yedingham triangle used in the Snainton 10m to make up the mileage. START in Seamer on B1249, at a bench opposite the church and proceed south towards the A64. At the roundabout take a sharp left (with care) joining the A64 by-pass. Continue north on A64 to Dunslow Road TI (Morrison’s/Scarborough Building Society/McDonalds) where straight ahead to Musham Bank TI. Take first exit (left) to Crossgates TI then take 3rd exit (right) on B1261 to Seamer TI (4.8 miles). Take 2nd exit (effectively right) staying on B1261 to join A170 at mini TI at East Ayton. Continue on A170 through West Ayton, Brompton and Snainton (approx 11.7mls). Just after Snainton village bear left onto B1258 and continue west for approx 1 mile to sharp left-hand bend. Take a right turn here (with care) and immediate left along the lane to Allerston. At the T junction at Allerston take a left on unclassified road to junction with unclassified road and B1258 at Yedingham where left and left again on B1258. 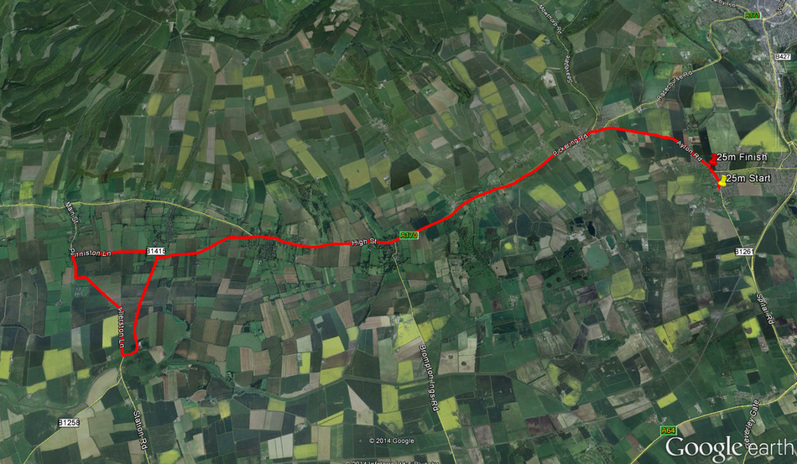 Continue northwards back to Snainton and the main junction with the A170 (approx 18.4mls). Turn right to rejoin A170 (WITH CARE). Continue eastwards on A170 retracing through Snainton/Brompton/West & East Ayton, taking second exit (effectively right) at mini TI at East Ayton on B1261 to FINISH just short of Seamer TI at stone village sign “Seamer”.